A Cromwell man has been arrested on threatening charges after police say he made comments calling for the killing of judges and court employees on his Facebook page. Edward Taupier, 52, of Cromwell, was arrested Friday after an investigation into comments he posted online between December 2016 and January 2017. According to the arrest warrant, the investigation began when a judicial marshal from the Judicial District of Middletown reported concerns about a particular individual’s posts on Facebook. The comments were posted to a Facebook profile for Edward Taupier, and made threatening comments against judges and court employees, sometimes naming specific people. 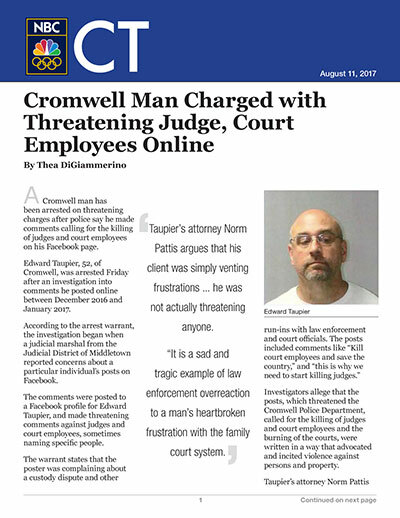 Investigators allege that the posts, which threatened the Cromwell Police Department, called for the killing of judges and court employees and the burning of the courts, were written in a way that advocated and incited violence against persons and property. Taupier's attorney Norm Pattis argues that his client was simply venting frustrations and while the speech may have been "ugly," he was not actually threatening anyone. “It is a sad and traffic example of law enforcement overreaction to a man’s heartbroken frustration with the family court system,” Pattis said over the phone to NBC Connecticut. Pattis added that his client already has a similar case before the state Supreme Court right now and that they intend to fight both cases on First Amendment grounds. Taupier was charged with first-degree threatening and inciting injury to persons or property. He was issued a $200,000 bond and scheduled to appear in court on Aug. 14.